.... by gifting your teen with a BBYO membership! Did you know that your 8th grader can join BBYO now, before they start high school in the fall? As you gather with your family to celebrate this Hanukkah, we hope you’ll consider giving your teen the gift of membership in BBYO. 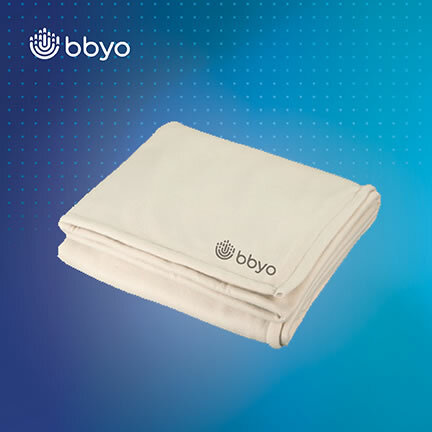 Best of all, if you sign them up by the last day of Hanukkah, you’ll get this limited-edition, BBYO fleece Sherpa blanket as our gift to you! BBYO has been loved by teens and trusted by parents for nearly a century. By signing your 8th grader up today, you’re giving them an amazing opportunity to be a part of a group of tight-knit local friends, as well as a community of peers from across the globe to support them as they enter high school and navigate their teen years. They’ll also gain access to exclusive events, leadership programs, meaningful service projects, Jewish enrichment opportunities, and weekend conventions. Membership is a one-time fee of only $149, and you’ll never have any more membership dues—ever. Be sure to sign your teen up by Monday, December 10 at 11:59 PM local time to claim your awesome gift!